I have always wanted my kids to do this Chia head costume for Halloween and they never would. My office had a Halloween party and I was going as a witch and at the last minute I said “I’m doing it! '” So I ran to Hobby Lobby and bought a shrub, a hot glue gun and a green toboggan. I cut the ends off the shrub and hot glued the bottom leaves to the toboggan, then I made the the box to tape to my jacket. It turned out much better than I expected and it took me about 1 hour to complete. To finish off the look I bought some $2.00 make-up that was clay color it took several layers of make-up I should have paid a little more for the make-up. Everyone loved it and they loved the fact that it was different! 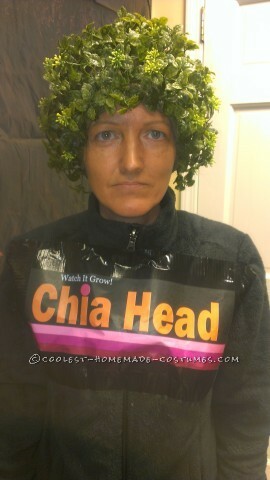 I was the only Chia Head at the party! There wasn’t a costume contest but if there had been I would have been a top contender. How did you make the Chia Head sign?? I love this costume idea!